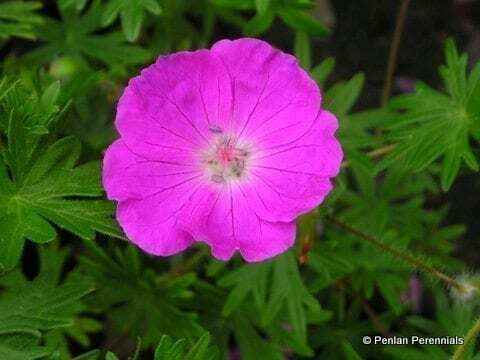 The leaves on this lovely geranium are deeply divided and hairy and the dark purplish red flowers are much larger than normal. Ideal for sunny spots towards the front of a mixed border, or for underplanting, but will grow equally well on walls or banks. Easy to grow, pest and disease resistant. It grows best in a well drained soil. If you live in an area of high winter rainfall, as we do, it is beneficial to mulch the crown of the plant during winter. Propagate using stem cuttings or divide established clumps in the spring.